Developers of a five-story Glen Ellyn apartment complex on the site of the old Giesche Shoe store have secured an agreement to buy the neighboring village-owned Main Street parking lot. 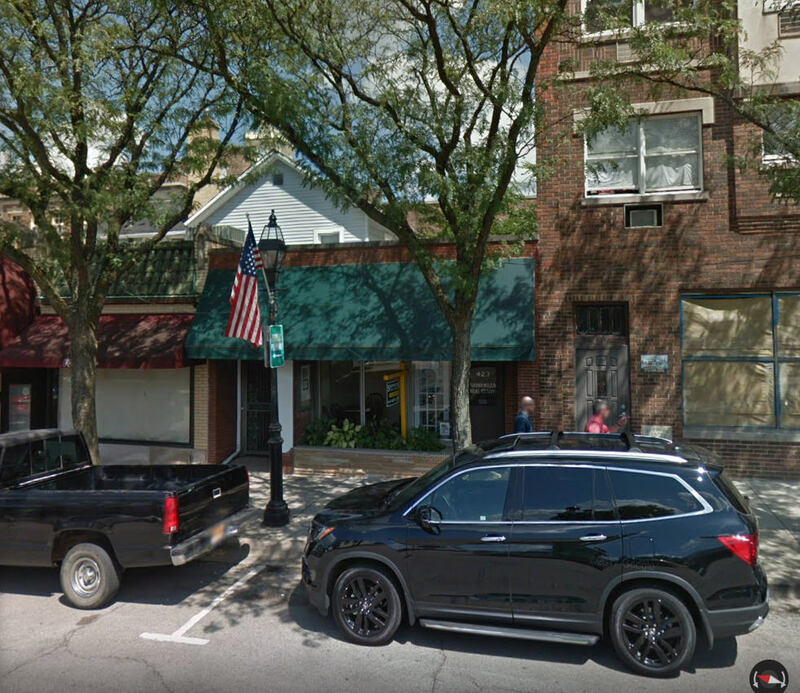 The deal involves several contingencies, but it marks one of the first official steps toward redeveloping the downtown Giesche property, the subject of several proposed projects that have failed to materialize since the family-owned shop closed in 2014. The agreement comes as developers prepare to meet with the village's plan commission Dec. 6. The latest concept shows a new facade, but the complex would still contain roughly 8,844 square feet of first-floor retail space, 107 upscale apartment units and a two-story parking garage. The building also now has a name: Apex 400. Under the purchase and sale agreement approved by village trustees this week, GSP Development would..."
Last edited by Cliché; 11-15-2018 at 06:53 AM. No doubt The Preservationist are prepping to oppose it because____________________________. F. The Historic Giesche no parking sign will be lost. G. The Historic parking lot lights would be lost. H. The Historic relationship between the village and St. Pete's would be lost. This calls for someone like Cliche to do a Youtube retrospective video of the Floral Clock. I'm picturing newspaper clippings announcing its arrival, smiling ribbon cutting photo, shots of the clock in various seasons, picture of some workers trying to fix it, donors posing by their engraved bricks, more photos of workers trying to fix it, etc. etc. All set to some sad song. Jeff Buckley's version of Hallelujah maybe. I can see it in my mind's eye, I just can't execute it. I'm an idea guy. Can you handle this, Cliche? I thought Ladesic was in favor? The genesis of the Main Street "parklette"--which includes a flower bed, now covered by snow, surrounding a large working clock--started nobly as a proposal from a forward-looking civic group. They wanted to attract more people to Glen Ellyn's center, while beautifying it and marking the millennium with a one-of-a-kind flair. But problems surfaced before the first shovel struck dirt, and they have hounded the project for months. Now, as village officials look for spots to place two time capsules on the site, they might want to consider fitting it with lightning rods too. "I still feel very strongly that it's stupid," said Kathy Lawson, as she finished lunch with two friends at the Santa Fe Restaurant, steps from the floral clock. "To have a floral clock where you can't have flowers five months out of the year is just kind of wasteful." Excavation began and crews found soil contaminated with gasoline from an old service station on the site. That discovery cost $5,000 and led to several days of delay. Then the engraved stone marker arrived and it fit only in one position: displaying the words "Glen Ellyn Millennium Floral Clock" toward the parking lot behind the clock. It was replaced with one that correctly faced Main Street, but that marker left out an "n" in millennium. Once complete, the clock chronically broke down, prompting one resident to tape a hand-size travel clock to it. Kids used the wide, flat clock arms as spring boards, and skateboarders chipped and blackened the stone front. Somebody decorated the floral garden with pink plastic flamingoes. The dedication, set for July 4, was delayed to early September, and the clock continued to malfunction. Village officials finally persuaded the man who supplied the internal parts to travel from Arizona to fix it just after Thanksgiving. He died two days before the trip, sending village officials on a global hunt for another repairman. "When the beautification of the clock with the spring and summer flowers does occur and the people are more accustomed to that whole, new plaza," Wark said, "I think most of them will find a great deal of pride and satisfaction in what we've done." The full story of the floral clock started in 1998, when Vision Glen Ellyn, a civic endeavor that gathered 200 residents and included a telephone survey, proposed the floral clock plaza. Wark, a leading proponent of the project, said it is the only one he knows of in the Chicago area. Still, Lawson, settling the bill with her friends, tried to take a long view of life in her already tony downtown. "If this is all we have to complain about," she conceded, "then things aren't too bad. Wow, great find and post. I never read that or knew of much of this, wow. This has been posted on Facebook and about 85% of the posters don't like it, what a surprise. They want that "small town charm" which I guess includes abandon buildings and storefronts. Hopefully they don't call for Chief Norton to be replaced by Sheriff Andy Taylor. "The new parking garage will contain at least as many existing surface stalls that are there right now," Planning and Development Director Staci Springer said. So am I to understand the village passed the new tax increase for the parking garage and they will only get the same amount of parking in the same location?? or is there another garage under construction? The tax increase is for a potential garage behind the Civic Center. The Apex thing is to justify giving a developer our property. We give them Main Street (and that strip lot that goes all the way to Glenwood) and a non-functional floral clock. They give us the same amount of public parking that we had before AND violations of our building height ordinances. As Michael Scott might say, that's win-push-lose conflict resolution. Those buildings will be removed to make way for a Pedestrian walkway from the "new" garage behind the Civic Center. Last edited by Cliché; 11-15-2018 at 02:42 PM. "The village would maintain and own that first level -- accessed off Main, Hillside and Glenwood Avenue -- as public parking." With the new parking garage behind Civic Center why not eliminate the first level of this proposed development and make it four instead of five floors? I don't think the new Civic garage makes up for the lost parking at Civic and Main surface lots, especially since a portion of the new Civic garage is reserved for the COD incubator.